This beauty isn’t a show bike from the 70s: it’s the actual factory ‘Red Line’-framed 750 cc Triumph ridden by AMA Flat Track star Don Castro. 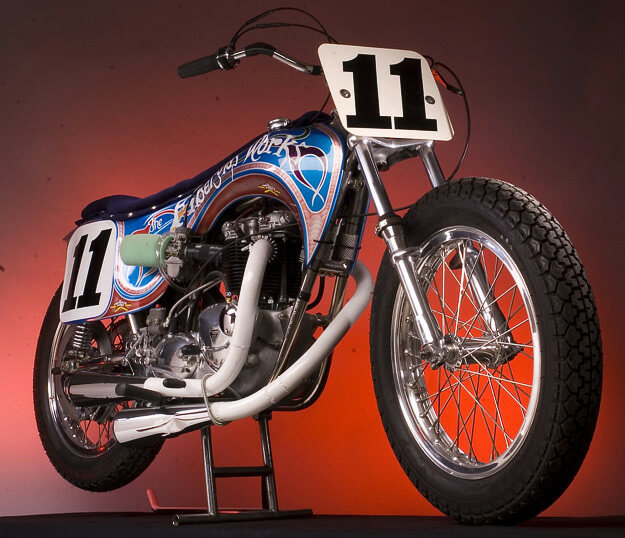 The psychedelic streamlined bodywork came from a sponsor called The Fiberglas Works; it was outlawed by the AMA for violating the anti-slipstreaming rules after just one outing, at the 1972 San Jose Half Mile. The Bonneville-engined bike has since been restored by Don Miller of clothing company MetroRacing.com, a long-time supporter of vintage racing. “The whole resto has been off and on for a long time. I started by obtaining that bodywork over 10 years ago, from Don [Castro]. The rest trickled in over the years,” Miller says. “Luckily I grew up when that kind of painting was cool and did a lot of custom van and bike stuff myself. I spent 6-7 days re-creating that beast. That’s with drying times, burying flake under clear, multi-colors and effects, sanding and rubbing to perfection, then hand lettering The Fiberglas Works and Don’s name on the back.” The effort was worth it: Miller now has one of the most beautiful flat track motorcycles of all time in his garage. Image via Jockey Journal. Head over to Triumph Flat Track for more supercool vintage Triumph action.